Parul Chauhan tied the knot to her BFF and their wedding pictures have taken the internet by a storm! They say, “Marry your best friend, that there is no foundation stronger than true friendship” - and it seems the famous TV star Parul Chauhan swears by it. The actress recently tied the knot with her BFF - Chirag Thakkar and of-course the pictures took the internet by a storm. 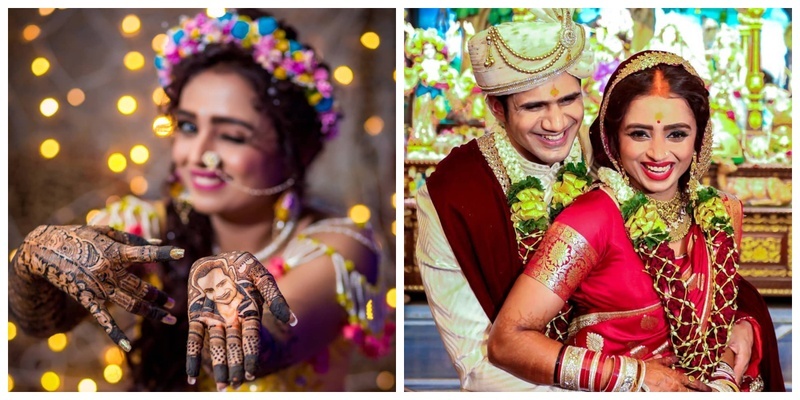 The couple kicked off their wedding festivities with a vibrant mehendi ceremony and I for one am in love with the pictures. How cool is her personalised mehendi with her hubby-to-be’s motif in it? Majorly crushing over her multicoloured lehenga skirt paired with a yellow noodle strap choli and floral jewellry. The couple decided on an intimate wedding at Iskcon Temple in Juhu, Mumbai attended by just close friends and family! Parul chose to wear a red Banarasi saree for taking the pheras, pairing it with a maroon dupatta, heavy day makeup look and a choker and earring set. Chirag on the other hand looked dapper in his ivory sherwani with golden detailing paired with emerald necklace.